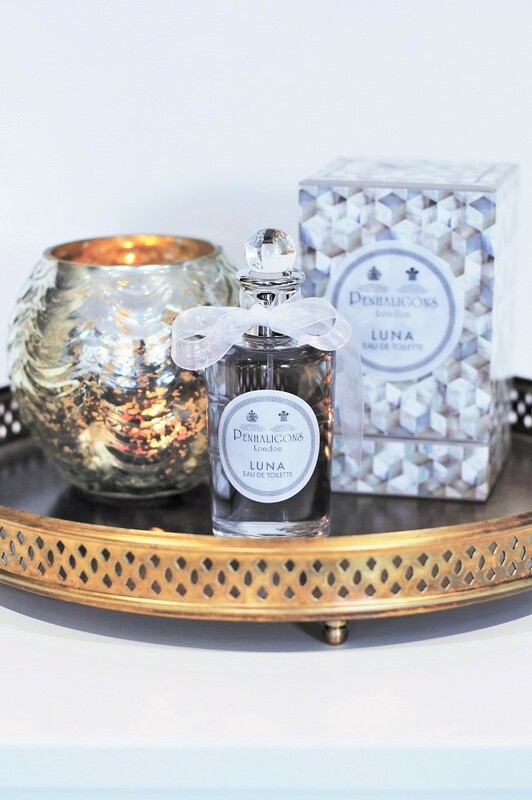 Luna is the fresh new floral fragrance from Penhaligon's, inspired by the mythical love story between the Ancient Greek goddess of the moon and Endymion. The luxury British perfume house was founded in 1870 by Englishman William Penhaligon who opened a barber shop on Jermyn Street and created original perfumes made with fine, rare ingredients for a sophisticated clientele in the decadent Victorian era. Penhaligon's is one of my favourite brands, not only for its beautiful products (which are still made in England today) but also for its beautiful branding. The quirky stores are designed like traditional Edwardian boutiques with vintage furniture, heritage design features and eccentric decoration like padded boudoir-style walls and antique light fixtures. Each fragrance has its own ornate styling, colour palette and font, but they're all tied together in Penhaligon's signature bottle: clear glass with an elegant ribbon-wrapped stopper, true to the founder's original design. Luna is kept simple and pale, with a silvery gold mother of pearl packaging and white shimmering organza ribbon. Introduced as the feminine counterpart to the woody Endymion cologne for men, Luna opens with refreshing orange and bergamot, the heart unfolds with juniper berry and jasmine petal then finishes with a sensual, long-lasting fir and musk base.